Last week a worker was killed in Shelton Connecticut when he fell 39 feet from a roof while installing skylights. In a article from ctpost.com it was reported that the worker was not wearing a harness and fell to his death. The contractor JC Silva Remodeling LLC is reported to be unlicensed and operating illegally. OSHA is investigating the fatal fall to see if there were any workplace violations. This news comes on the heels of recent announcements from OSHA about fall hazards in the residential construction industry. Last year OSHA announce a National Emphasis Program (NEP) to enforce workplace safety in the residential construction sector. This means the residential industry across the country is a targeted industry due to the thousands of injuries and hundreds of deaths that occur every year from falls. 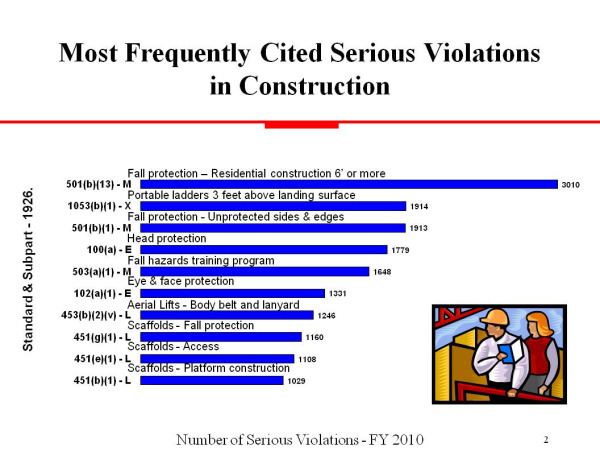 OSHA has ratcheted up their enforcement in the residential sector as evidenced by the 2010 and 2011 most cited violations; fall protection related. In addition to the NEP in Region 1 (New England) there are two additional overlapping Local Emphasis Programs (LEP). One for the residential construction industry in New England requiring OsHA enforcement officers to focus on residential job sites. The second is a LEP specifically to enforce fall protection in the residential sector. The fall hazard LEP is in effect until September of 2015. This means OSHA will focus on residential job sites for almost three more years. There are numerous reports every week about some contractor facing fines for not following the OSHA Fall Protection Standard. Two weeks ago I learned and reported the new Memorandum of Understanding signed by Regio 1 OSHA and EPA to join forces on the enforcement of their regulations. As far as we know this is the first MOU written to help each agency cover more ground on the enforcement front. Each agency will share information on each others enforcement activity making it easier to catch contractors avoiding compliance with RRP, OSHA Lead in Construction and Fall Hazards. This death will likely lead to increases OSHA enforcement activity in the Bridgeport and Southern Connecticut area. We have our second Fall Protection Training on Subpart M, L, and X for residential contractors at Rings End Lumber on 3/27/2012. Click here to register. What are contractors required to do to comply with the OSHA Fall Protection Directive that went into effect on 9/15/2012? When working 6 feet above any lower level use safety nets, guard rails and or fall arrest systems. Train all workers on the fall protection standard, how to use protective equipment, how to recognize fall hazards and document the training. Write a site specific plan if one of the three methods are infeasible. The site plan must be written by a competent person and each worker must be trained on it. What about my sub contractors? The general contractor is responsible to make sure that all sub contractors who are exposed to fall hazards are compliant with the standard. If OSHA comes by a job site and a sub is in violation of the fall protection standard both the sub and the general contractor will be fined.